Now don’t get me wrong, there are awful, awful aspects to both SOPA and PIPA. The prospect of DNS blocking is egregious censorship. The prospect of cutting off funds and ad revenue to “infringers” without due process is egregious. Even without those provisions, though, we still don’t need or want SOPA or PIPA. Why? Because we already have dangerously broken copyright law: The Digital Millennium Copyright Act. It’s almost funny, in a I-want-to-cry sort of way. 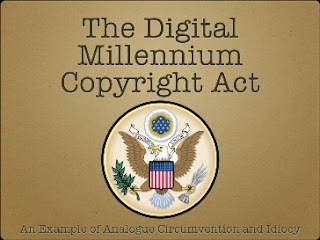 SOPA and PIPA seem to be constructed on the premise that the DMCA had the right approach, but just isn’t strong enough. The fact of the matter is that DMCA has the wrong approach and is too powerful. There’s evidence to back this up. The main DMCA principle that SOPA and PIPA are building on is the takedown request. Under DMCA, anybody – anybody – can file a takedown request claiming that something on the Internet falls under their copyright and needs to be removed from wherever it is, typically YouTube. That’s all fine and dandy — good even — the problem is that there are norepercussions for filing a bogus takedown request, something that happens all the time. Under DMCA, the content just comes down. Under SOPA and PIPA, the government could call on ISPs to block entire sites via DNS, not just specific content. Granted, those DNS blocking provisions have largely been “dropped,” but SOPA was “shelved until consensus,” so take that with a grain of salt. Even without DNS blocking provisions, SOPA and PIPA still lend an extra power to the standard DMCA takedown; they can force advertisers to sever ties with accused infringers, all in an insanely shoot-first-ask-questions-never sort of way. Let’s take a look at some of the DMCA craziness that’s already happened, shall we? Nyan Cat got ripped off YouTube, probably by some random prankster who thought it’d be funny to file a request. The creator stated he didn’t file the request. The video was reinstated, but no one ever found out what happened. Jimmy Iovine — of a Universal subsidiary — used a bogus DMCA takedown request to remove a music video by an artist named Skepta from YouTube. Iovine didn’t own the video or the song. No, instead he wanted to get it out of public view so he could liscense the tune for Eminem before the public started to associate it with its original artist. Nothing bad ever happened to him because of it. Random DMCA takedown requests took out Justin Bieber’s YouTube channel along with Lady Gaga’s. It’s still unclear who filed it. Viacom had the trailer for The Last of Us removed from YouTube because it aired on Spike, despite the fact that it was clearly owned by developer Naughty Dog. This may have been an automated accident, but an accident nonetheless. And under SOPA and PIPA, automation isn’t likely to stop. Warner Bros. admitted to taking down files to which they had no claim after hosting service HotFile tried to play nice and gave Warner access to hosted files. Warner also took down legal download speed enchancing programs because they might be used to download pirated content. Warner is currently being sued by HotFile. Universal filled a takedown request to remove the MegaUpload song from YouTube despite having no right. Probably because they didn’t like that some of their artists agreed to support what Universal considers a rogue site. MegaUpload is currently suing Universal over the matter. Universal later filted a takedown request against an episode of Tech News Daily that merely mentioned the MegaUpload song and played a short clip, the use of which is clearly covered under Fair Use. There are probably many more examples that never hit the news or occurred on sites with less public presence than YouTube. The main takeaway to be had here is that in all these cases, a DMCA takedown request resulted in the wrongful removal of content from the Internet. In almost all cases, it was put back after things were “straightened out.” No harm, no foul, right? Wrong. When you’re just talking the brief removal of content, admittedly the damage is generally minimal. Under SOPA and PIPA, sites would face the temporary removal of content plus the possible blocking of their entire siteand denial of funds when advertisers are forced to cut them off. Even if the situation is cleared up and the content is reinstated, the downtime could be enough to bankrupt a startup. A copyright holder on the other hand, especially a large one, has virtually nothing to lose if their content is hosted illegally for a limited period of time because piracy is not theft. DMCA is already aimed at the little guy, SOPA and PIPA just give the gun a bigger caliber. Wouldn’t you think that maybe we should correct existing copyright law — copyright law with many documented instances of abuse — before introducing new copyright law? Especially new copyright law built on the premise that its predecessors were heading down the right path? SOPA and PIPA — in any form — are awful because they are an iteration on an already flawed method. When you take a wrong turn at a fork in the road — DMCA — you don’t get anywhere by going further down that path. The only way to make progress is by going back and correcting your original error. No further copyright law is going to be remotely helpful or beneficial to the people it claims to protect unless it goes back and fixes the mistakes made back when DMCA passed. Obviously, we shouldn’t be making any more mistakes, but we really should be fixing the ones we’ve already made. Stop SOPA and PIPA now, while we still can.